Ban classroom conformity–allow children to learn in their own way! I recently came across a couple articles that reminded me of how important it is to allow children to be free to express themselves and really discover their own take on the world around them. The first article was authored by a parent who was approached by her child’s school and recommended occupational therapy for their child as a way to deal with what her teacher saw as behavioral issues (she wouldn’t sit still during circle time). I am often shocked at how many of these types of articles get printed. I guess I shouldn’t be. We are in an age in our education system where we are looking for answers to every “problem” that comes along. The author of this article discussed the culture of conformity that has become commonplace in our schools. Adults expect children to behave a certain way in an educational setting, and too often when they don’t, it is assumed that there is something wrong with the child and they need corrective action. The second article considered the importance of play in a young child’s life. The author wrote about the relationship between the removal of play from children’s school days and home life and the increase in children diagnosed mental illness. He uses historical and biological contexts to make his argument that play is an important, if not vital, part of a young person’s upbringing and we need more of it, not less as we move through a technology-infused future. We want our children to grow up to be curious and productive citizens. We want children to be able to function on their own and with others in a manner that improves everyone’s lives. Sure, we need rules for safety, but we also need children to help create their own rules as they learn how the world works. Perhaps we can let go of our own feelings and goals and let children determine their own because the more we push them to conform and be “normal,” the more restless they become. So what can you do to ensure that children remain curious and develop into productive citizens? Give children plenty of sensory activities that go beyond play dough. Include materials that allow them to relate their play to the real world including vehicles, costumes and other props. Share in a child’s delight as they pretend to make soup from water, dirt, sticks and leaves. Make time to engage with children in dramatic play, and allow the children to lead the created environment and conversations. Above all, talk to children about what they are experiencing. How does it feel? How did they do that? Where is it going? What happens if…? 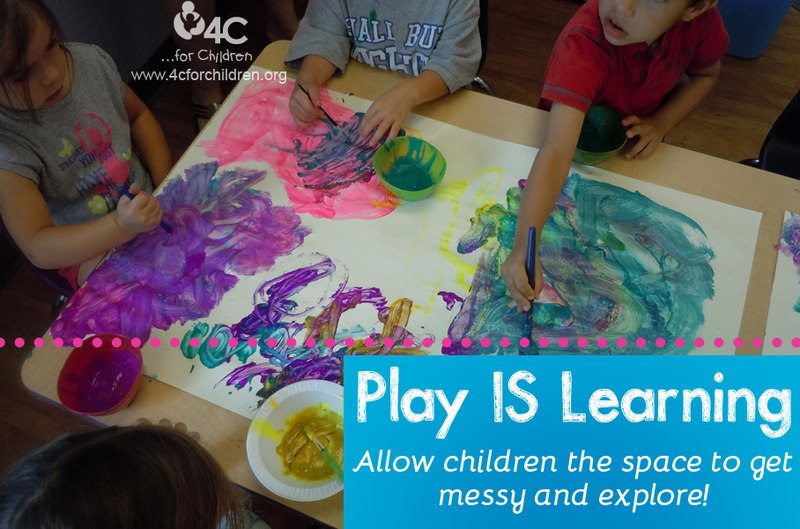 Remember that children learn best through active play but they can’t do it alone. They need you for guidance, support and confirmation of their trials. Removing children from opportunities to play and interact with their peers and adults removes them from the opportunity to be successful in life. This entry was posted in Best Practice, Early Childhood, Family Child Care, Infants and Toddlers, Preschool, School Age and tagged Exploratory play, learning through play on December 10, 2013 by Josh Craig.